*NOTE: This company is also operating direct coach service to Resort World Sentosa. Please visit their website for more information. If you want a comfortable, luxurious experience to get to Singapore from Kuala Lumpur or the other way round, Odyssey Prestige Coaches is the perfect choice for you. Odyssey Prestige Coaches not only provide a high standard service, the coaches are equipped with facilities such as WiFi and board entertainment system. Light meal will also be included and served during the journey. 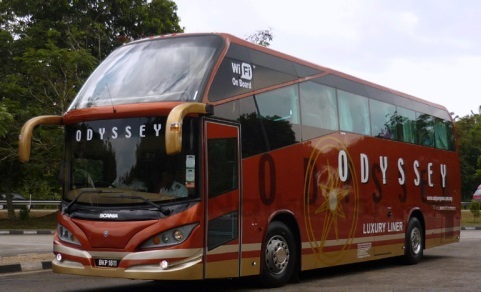 Odyssey Prestige Coaches was established on 2007 and the officesis located at Mont Kiara and Avenue K in Kuala Lumpur while the counter office in Singapore is at the Balestier Plaza. Bus from Kuala Lumpur will depart from Mont Kiara in Jalan Kiara and the drop off point will be at the Balestier Plaza in Balestier Road. Meanwhile, the bus from Singapore will depart from Balestier Plaza and the drop off point will be at Mont Kiara. The prices for the bus ticket are affordable given the facilities included are very good.